The ideas and design of this deck were created by Theodore L. De Land in the first decade of the 1900s. 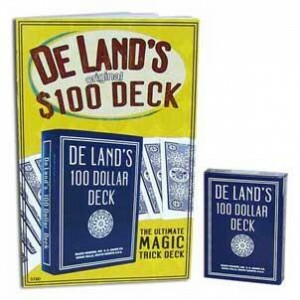 More than 100 years later, De Land's marked deck and his other magical inventions continue to fool audiences...and even the most discerning spectator. The "100 Dollar Deck" contains a secret marking system, giving you the ability to know a card without seeing its face! The deck is also "tapered" (a Stripper Deck) giving you the ability to control a card or groups of cards by touch alone; anywhere in the deck! To top it off, this deck has yet another secret marking system giving you the ability to instantly name the location of any card! As an added Bonus, we have included the greatest "packet trick" ever invented...De Land's "Pick It Out" aka, The Million Dollar Monte. Instruction Booklet included with the Deck. Specially printed in Bicycle Stock by the United States Playing Card Company.